CGCC Connection: New Year, New You! Join the CGCC Coyote Fitness Center for $25.00 a semester and let us help you to get "Coyote Strong". CGCC wants to help you achieve all your health and fitness goals, so sign up for one of our amazing Group Exercise classes; we offer, Pilates, Yoga, Gentle Yoga, Stretch and Relax, Zumba and Boot Camp. Visit this CGCC Group Exercise Link to get more information. There are many things you can do to improve your daily health and wellness. Here is a list of 10 easy basic tips to a healthier day! 1. Create a daily personal intention, something that really speaks to your passions, and then find one action, song, story or journal about it. Write it down so you can see it during the day. 2. Go to school/ work 10 minutes early and walk the campus, do the same thing over lunch and right before you go home take one last stroll (That's 30 minutes right there) Maybe you can even convince a family member to take a 10 minute walk after dinner. 3. Take a stretch break during your day. 4. 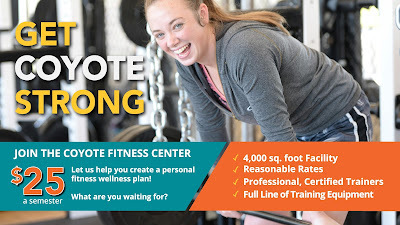 Join the CGCC Fitness Center for $25.00, we are here to help you! 5. Take a credit Activity Class ( Yoga, Pilates, Zumba, Boot Camp) and get moving. 6. Buy a specific water container and keep track of how much water you are drinking/day. 7. Meal plan for your week and bring healthy snacks and lunches. 8. Let go of what you can't control and learn to breathe (Stress Management). 9. Take a 3-5 minute mental break every 1.5 hours, get up and walk around say hello to someone (Get away from your computer). 10. Laugh....laugh a lot! Laughter is the best medicine!